Africa is the world’s second-largest continent, covering more than 30.3-million square kilometres, and home to 54 countries. This massive expanse of land and its 1.1-billion inhabitants live in environments that range from deserts and jungles to bustling cities, which means the risk of disease is higher than in other parts of the world. This is why Flight Centre Business Travel will help you ensure that your routine vaccinations are up to date before embarking on a visit. Travel vaccines or travel immunisations are injections provided to travellers to protect them from contracting serious illnesses. Different parts of Africa require different vaccinations, some of which are mandatory, while others are recommended. Your Flight Centre expert can advise you on the required vaccinations and precautions for the specific African country you’re travelling to. 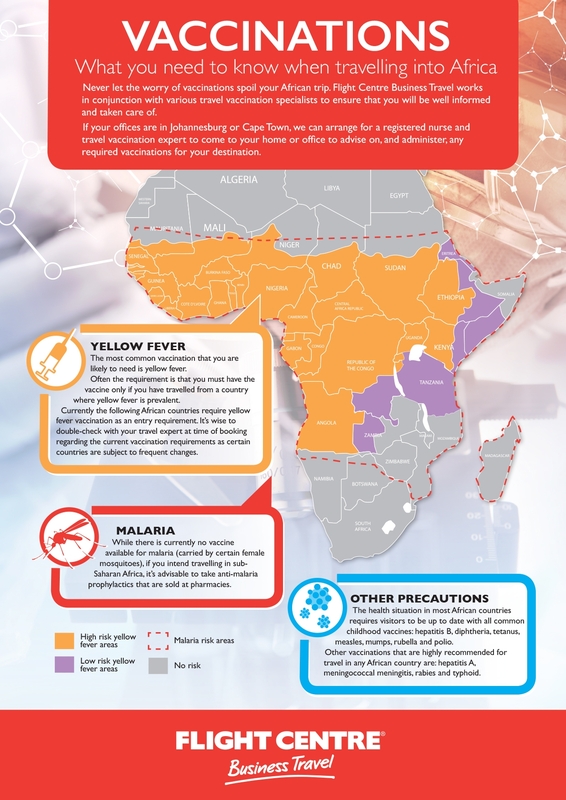 On a country-by-country basis, some African countries have stringent entry requirements and won't permit you to enter the country unless you have proof you've been vaccinated against a specific disease. Speak to your Flight Centre Business Travel specialist today for more information.